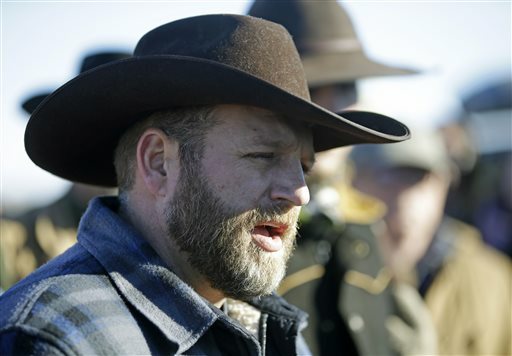 PORTLAND (AP) — The leader of an armed group that for nearly three weeks has occupied a wildlife refuge in eastern Oregon has begun speaking with the FBI. Standing outside the municipal airport in Burns, Oregon, Ammon Bundy spoke by phone Thursday to an unnamed FBI negotiator. The federal agency has used the airport, about 30 miles from the refuge, as a staging ground during the occupation. Bundy said he went to the airport to meet with FBI officials face to face, but they declined to meet him. Bundy said the FBI had called him 14 times in a row earlier this week, but he couldn’t pick up the phone because he was in a meeting. He also told the FBI the agency doesn’t have “the people’s authority” to station at the airport. Earlier this month, officials said the FBI has jurisdiction over the armed takeover of the federal buildings in the refuge, as well as any crimes committed there. “This occupation has caused tremendous disruption and hardship for the people of Harney County, and our response has been deliberate and measured as we seek a peaceful resolution,” the FBI said Thursday in a statement. On Wednesday, Oregon Gov. Kate Brown said she was angry because federal authorities have not taken action against Bundy’s group, which began occupying the Malheur National Wildlife Refuge Jan 2. The Democratic governor said the occupation has cost Oregon taxpayers nearly half a million dollars. “We’ll be asking federal officials to reimburse the state for these costs,” Brown said. “We will leave there if those buildings are turned over to the proper authorities… and never used again by the federal government to control land and resources unconstitutionally in this county,”Bundy said. Bundy said that despite some negative sentiments against his group expressed at recent community meetings, he believes his group’s work is appreciated by locals. He said the armed men have been “helping ranchers,” doing maintenance on the refuge because “it’s in a bad shape,” and taking care of fire hazards in the refuge’s fire house. “It will turn a lot of things around if people have access to land and resources the way it was intended by our founders, the economy can turn around,” Bundy said, adding that until that process is “well on its way,” the group won’t end the occupation. Ammon Bundy has proven over and over again that he is a liar and deserves to be in prison. That’s your Voice of Reason? Go look in your Mirror? he’s a freeloading scum welfare case just like his father, why should these low lives get a free ride when everyone else pays their fair share. Why are the people of Harney County responsible for the actions of these TERRORISTS!